Optimise Electrics is a full electrical services provider. We provide a diverse range of electrical installation to a wide range of buildings. From electrical installation in your home right through to commercial and industrial premises, we can ensure all your requirements are met. We provide electrical maintenance to ensure your building complies with all the statutory requirements or just to keep your business running. We also carry out a range of electrical Inspection and testing. Optimise Electrics can also provide you with a service to rectify electrical faults in your home or to carry out a range of electrical installations. Optimise Electrics provide an electrician service accross Cardiff, Barry, Penarth, Vale of Glamorgan, Bridgend and also many more areas on request. We carry out a wide and diverse range of electrical installations and can cater for your individual requirements. From new build installations, occupied building installations right through to industrial installations. We are also “Part P” registered electricians to ensure your domestic electrical work is carried out in accordance to the latest electrical regulations and also the building regulations. We can carry out all your electrical work from small electrical installations/alterations right through to new builds, re-wires and exterior electrical installations. Optimise Electrics have experience in all areas of electrical work and have developed individual specialist services to suit industry specific requirements. Our electricians personal approach, aiming to achieve a high standard and continuing to improve our services has seen us enjoy continued growth both in the domestic and commercial market. If you are a retail outlet looking for monthly statutory inspections, part of the health service looking for fixed wire electrician inspections or the hospitality industry looking to update the electrical installation in your building you can be assured Optimise Electrics will aim to provide the best service possible. At Optimise Electrics our electricians will aim to provide you with the service you require to keep your business running. Our electricians can work with you to ensure your objectives/requirements are met right from the initial stages. If it’s an electrical inspection you require or you would like us to become available for reactive call outs to your stores. We will structure our services to suit your requirements. Our electricians that cover Cardiff, Bridgend, Barry, Bristol and South Wales can carry out monthly inspections to your retail outlets to ensure your buildings operate without complications and also comply with all the required regulations and Health & Safety obligations. With a high client retention it is further credit to the great service we offer. As a full electrical service providor you will not need to search around for seperate companies for your electrical needs. Optimise Electrics have built up experience in working in the public sector. We currently or have worked in many environments ranging from schools, universities, government buildings, council buildings to name just a few. 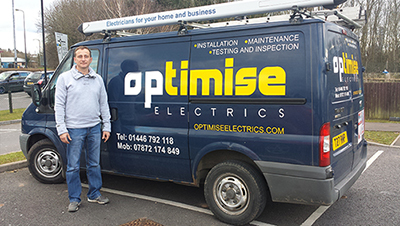 At Optimise Electrics, our electricians aim to provide you the service you require. If it’s an installation project, routine maintenance or electrical inspections to fulfil your Health & Safety requirements. Optimise Electrics have the highest level of registration with NAPIT (National Association of Professional Inspection and Testing) This enables them to provide all the electrical work you require to ensure your building comply with all the current regulations and Health & Safety requirements. If its additional call out cover to supprt your in-house engineers or an electrical installation project or you may want to use our specialist fields of electrical inspection & testing. We can provide you with a service to support your buildings and operational needs. Optimise Electrics can offer electrical services in Cardiff, Barry, Bridgend, South Wales, Bristol, West Wales. For multiple building contracts we can also cover a wider area. Over a long period our electricians have built up a strong relationship with our customers. Finding they use our services for all their electrical requirements. We aim to provide the best service possible and cater for small electrical work right through to re-wires, new builds and external electrical installations. We carry out electrical work throughout South Wales, Vale of Glamorgan, Cardiff, Barry, Cowbridge, Llantrisant, Penarth, Bridgend. We can provide you with an electrician for electrical faults within your home, electrical installation work and also provide you with all your electrical safety inspections. We are “Part P” registered with NAPIT (National Association of Professional Inspecting & Testing). All electrical work that requires notification to the local building control is carried out by us. When notifying electrical installations in your home it also comes with a 6 year insurance backed guarantee. Optimise Electrics are also fully approved to carry out your electrical safety inspections and provide reports on the condition of the electrical installation. We are fully insured and also Trustmark registered. We continually update our qualifications to keep up to date with all the current regulations. Our electricians also carry out multiple domestic site contracts for a range of clients form landlords, letting agencies, estate agencies and property managers. These services are carried out accross South Wales, Cardiff, Barry, Bridgend and the Vale of Glamorgan. Optimise Electrics are approved installers of energy saving equipment for your homes. With an average cost saving of 10-15% on your energy bills. With no lifestyle changes to make and a 5 year full guarantee. This is a great product to reduce your carbon footprint and also save you money. At Optimise Electrics we provide a range of electrical services to the Health service. From local health centres, Care homes, Hospitals and trusts. If its routine maintenance, and electrical installation project, or statutory electrical inspections our electricians can provide you with the service you require. We understand it is essential for these environments to continue to provide the care for your residents. We will carry out the work you require to cause the least disruption as possible. Optimise Electrics carry out electrical work in a wide range of commercial buildings. If it’s a warehouse, multi let units or you are a managing agent we can provide you with an electrician service to suit your building and tenants. Optimise Electrics have the highest level of registration with NAPIT (National Association of Professional Inspecting & Testing) This is to further ensure all of our commercial clients receive the high level of service we aim to provide. Optimise Electrics work hard to specialise in seperate areas within the electrical industry. We have worked in the commercial sector over many years and can offer you a wide range of services in this sector.